Data protection has never been more in the forefront, as information increasingly is the lifeblood and differentiator in a constantly changing world. As the leader we see across the enterprise, which helps solve the larger information management problems that come from accelerating digital business. Keep up with the latest trends and use the following tips to maximize the value of your data protection investment —meet more-demanding SLAs, simplifying management across a complex IT environment, and reducing costs— so you can free up resources to innovate and create business value. 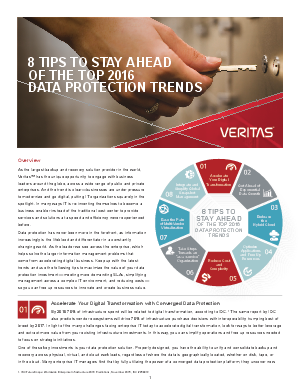 Download this whitepaper to learn 8 tips to stay ahead of the top 2016 data protection trends.